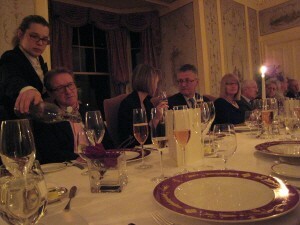 We took our glasses of Billecart-Salmon champagne into the billiard room to toast a group of giants from the River Tay. “The Magnificent Seven we like to call them,” James Payne, the General Manager at Kinnaird, told us. They stare down from their glass cases, huge salmon between forty and fifty pounds, caught during the 1920s by various members of the Ward family. Back then the daily visit to the river to cast for a Tay salmon was all part of life in the big country house where the talk over dinner was of rods, flies and river levels and whether there were any salmon in the pools to fish for. It was a way of life the English gentleman and his family invented and it goes back at least 200 years when Scotland was hailed as a sportsman's paradise. The spread of the railways during the late nineteenth century brought the aristocracy north for the so called “Scottish Season.” They built grand country houses and estates, many of which can still be seen today when you travel through the Scottish countryside. The Wards arrived at Kinnaird in 1927 and Constance Ward is still in charge. An American by birth she fell in love with the Perthshire countryside that her husband Reggie introduced her to; and when he died her decision to turn the house into an hotel might have been the end of that stylish way of life. Not so! Connie Ward insists on offering her guests old fashioned hospitality, along with a genuine opportunity to live the house party life she loved so much and which is the true spirit of Kinnaird. So you can still cast a line over the same pools that those astonishing salmon were wrestled from and shoot pheasants, duck and grouse over the 9,000 acre estate. Best of all, the house oozes an uncanny feeling of its old self, which dates back to 1770. Much of the original furniture stands where it always has - the grand piano in the big sitting room surrounded by feather sofas and chairs, pictures, photographs and books. We all sat at a long table and after a short discourse on the delights of Billecart-Salmon from M. Billecart we tucked in to a delicious meal. A buzz of hearty conversation swept round the room - always a good sign of a meal being greatly enjoyed. It was beautifully served. Waiters and waitresses watched over us and diligently brought us each course; and then it was time to adjourn to the sitting room to sample a golden glass of brandy or malt whisky. If you are not fishing or shooting at Kinnaird there is a smart tennis court to keep you happy. Otherwise struggle to a garden chair for a snooze with the gentle tap of croquet balls in the air: next morning take a picnic lunch and go for a walk along the river valley or climb into the hills for a spectacular view of the Tay valley. Close-by are the estate's farmhouses and cottages, which are also available to stay in. One of them sits like an eagle’s eyrie overlooking Kinnaird, another, called Ferry Cottage, lies on the riverbank within casting distance of the water. It is an opportunity to try self-catering knowing that you can always run back to the main house for proper sustenance. When dinner comes round be prepared for something special. 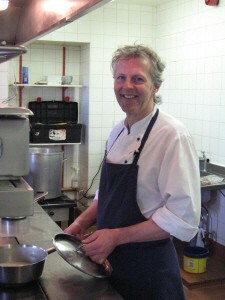 Chef Trevor Brooks prepares superb and memorable dishes from wild salmon and game, wood pigeon and rabbit, beef and fish. Vegetables and herbs are brought in from the kitchen garden. Heather honey, home made yoghurt and porridge is a must for breakfast and remember to try the kedgeree (a mixture of rice, flaked fish and boiled eggs) . From the dining room window the wide green valley stretches out before you. In the far distance the busy A9 can be seen with what seems like dozens of tiny, toy vehicles passing up and down. Once again your eye is drawn back to the river and you realise that without the wild salmon that run it, this house would not have been built and the pleasures of true country house living would have remained undiscovered. 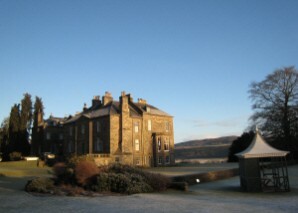 Kinnaird, Kinnaird Estate, By Dunkeld, Perthshire. Double room with full breakfast and dinner including taxes for two people from £275 ($535) rising to £475 ($926) in high season.